On Sunday womens go to church. 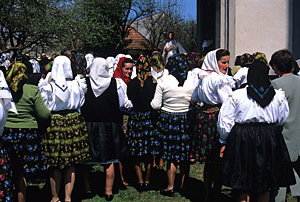 The Maramureş of today is a surprising mixture of ancient and modern, of Romanians, Hungarians, Ukrainians (Rusyns) and gypsies, of religions of different denominations, of hand-woven woollen vests and high-heel sandals, of horse carts and powerful cars, of markets that sell local potatoes and imported bananas, and also of bars and terraces to enjoy a cup of coffee or a beer. In any case, the essence of Maramureş subsists: generosity, warmth and solidarity. Old house in the village of Rozavlea. Here many young people believe that their corner of the world is unique and irreplaceable, even if many choose to work abroad for some years or more. The celebrations of life, weddings and baptisms are joyful occasions. One eats well, one drinks well, and the music, played by a local group or mixed on a computer, is a reason for dancing long and hard – all night if the occasion is a wedding. 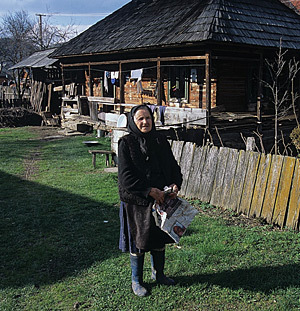 The wooden houses are solid, human-scale and noble, and are a testimony to the millenarian know-how of working wood. The gates – that are still made – illustrate the mastery of the artisans, the intimate relationship they have with the material. The interiors of the houses nearly explode with colour, good smells and small objects that tell of the creativity of the women, of their weaving, of their skill in conserving foodstuffs for the long winter. As if to thank the heavens that they have been lucky enough to be born in these valleys, the Moroşeni built their churches – out of wood. 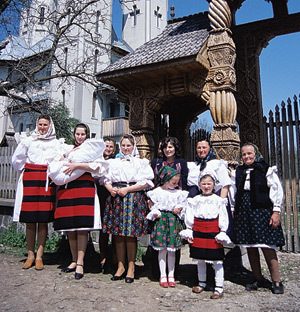 A family in front of the new stone church of Breb. 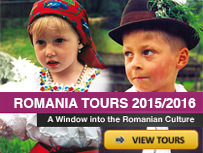 Forget all those sordid and malevolent stories you have heard about Romanians. Of course, as everywhere in the world, there are those who specialize in thievery without a second thought… But, one has to remember that this is not the rule of the country (as it is not in your own home country), and that there still are those who are simply enchanted by the fact that someone is interested in their corner of the world. 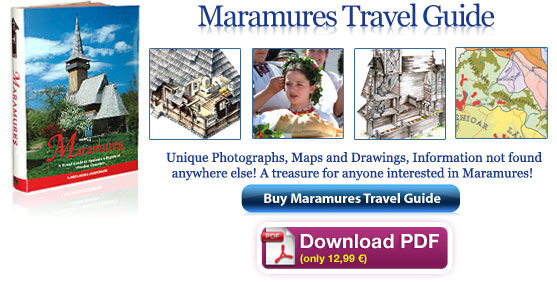 The people of Maramureş like foreigners and will do the impossible to show you the way if you ask for it. Most of all, one has to leave behind any fears of being robbed, cheated or mistreated. The traditional clothes are a joy! Coloured and embroidered, the clothes also seem to have been designed not to hamper movement, effort, dancing. 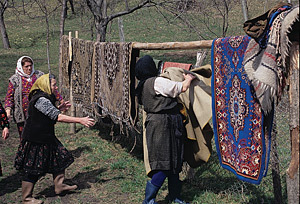 Wool, linen, hemp, leather, all products of the region, have contributed to the creation of these costumes that are worn with respect as they reflect the talent, the work and the tradition of the Moroşeni. Heavy carpets washed at the whirlpool. Walking is without doubt the best way of getting to know the region, for the only thing that can rival the hospitality of the people is the beauty of the land itself. The distances between the villages are short, only some kilometres, and the possibility of meeting nice people on the way is assured. There are several footpaths that crisscross Maramureş and its mountains. This said, it is nearly impossible to describe well any trek outside the official routes, for people walk at different speeds, nature changes very fast with the changing of seasons and the passing of time, and the markings can be hidden with the growing vegetation.